AWFUL ART SUPPLIES OUT THERE. HERE ARE MY FRUSTRATIONS...PET PEEVES!!! *Once again..this is only my opinion...and my experience. You may have a wonderful redeeming story about the art supplies I find frustrating! 1) PENCILS - WHAT IN THE WORLD??????? I have found a brand or two that are pretty consistent...but what has happened to the pencil industry?! Soft cheap wood that won't sharpen properly, lead that is broken all the way through and keeps falling out...erasers that only get marks off because they are part sand paper?!?!? Come on pencil makers...make me some pencils that will actually last! 2) COLORED PENCILS - I'm not sure if I should blame the people that make them, the people that ship them, or the people that stock the shelves?! 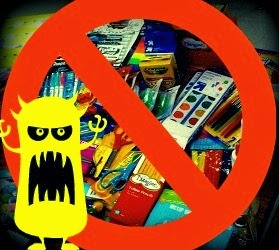 My students love colored pencils...I love colored pencils, but you know what I don't love? The fact that they lead falls out faster than the pencil can be sharpened. 3) WASHABLE GLUE - The issue....it is washable because it is white water!!!!!! BLAH!!! 4) FISKAR SCISSORS - WHAT HAS HAPPENED TO YOU!?!?!?!? You use to be the greatest thing around....no one could beat you. Now...your cheap plastic & construction make me long for the good ol' days. I can not tell you how many of my new Fiskar scissors have broken(where the handle attaches to the scissors). I still have some of the Fiskar scissors from when I started teaching here 13 yrs ago that are still going strong(though a bit rusted). 5) CRAYOLA WATERCOLOR (8 color ovals) - The colors are light...there are air pockets in the colors...and the "pans" of color are very shallow...so it doesn't last long. 6) ROSEART CRAYONS - The colors aren't bad...but the texture is very "crumby" & they break in half with very little pressure from little hands. Also...don't even try to laminate things colored with RoseArt crayons. 7) ELECTRIC PENCIL SHARPENERS - I've not had any luck with electric pencil sharpeners in my room. I gave up on them and have metal hand held sharpeners. If you have a great brand..please share. I may be willing to try again. 8) MASKING TAPE (EVEN 3M) - I am an expert tape tearer-offer!!!! However...masking tape has gotten so cheap...it does not tear evenly. So having children tear masking tape is surely one of the levels of "the bad place". Are they really saving that much money by giving us crappy stuff?!?!?! 9) RULERS - Is it just me...or are rulers SUPPOSE to be straight??? What in the world??? Is the Old Crooked Man working at the ruler factory these days??!?!? 10) FELT - Can sheets of felt not be consistent in thickness? Why is it...when I order a pack of felt...I can see through some parts of it but not others?? Is it too much to ask to have a consistant piece of felt?? WHAT ABOUT YOU?? WHAT ARE PRODUCTS YOU ONCE LOVED...BUT NOW HATE(or dislike a good bit)! HAVE YOU EVER WRITTEN THE COMPANY? I so agree with you on each and every item you mentioned. To make it worse, I'm a classroom teacher, who loves art, and there is no money for supplies. Luckily I married a man who is okay with me just buying the supplies with my personal money. If I'm going to spend my own money, I at least want quality supplies.....GRRRRR! I am not giving up the hunt... surely they are out there somewhere! - Elmers Glue All, all the way. It's gotta stay stuck. - I strongly second the Ticonderoga Laddies for the same reasons as Christie. I will never use regular pencils. (Make sure the kids only sharpen one end or the lead can start to shift on some of them). I get the ones without erasers. They stay usable for a long time between sharpenings. - Prang watercolor refills all the way. - Xacto school pro works well. I highly recommend buying it locally from a place that will allow you to exchange it when it fails. I save the receipt (tape it to the bottom or sharpie the receipt number/date on the bottom of the sharpener) and exchange it for the life of the warranty. One school I started in has a school smart one that is a beast year after year! I would recommend it except that now it looks like the design has changed so I can't vouch for the current one. - Fiskars I miss the old you. No need to get flashy... please just be you... the old you. - Crayola class pack of oil pastels please. They consume quickly but the color is rich and blends well to make intermediate colors. I've been trying to work though a stockpile of a different brand but I long to get back to the Crayola! You are dead on with the masking tape and the electric sharpeners. My husband bought me a very expensive electric sharpener as a gift when I first got hired and it didn't even make it through the first year. I even sharpened all the pencils myself to make sure the kids didn't break it but it still didn't last. This year I bought a cheap battery operated one at hobby lobby and its been great. I have taken to buying Mavalus tape instead of regular masking tape for that exact reason! Mavalus tape is amazing.....but $$$$$! We use that for vbs at church. Scissors! Fiskars - like you, my 15 year old ones are still pretty good, I can't get new ones to last a year. Electric sharpeners - "What do you mean you can't sharpen colored pencils?? We can mill titanium. We can sharpen colored pencils." I've gone to Prang watercolors - replaceable pans! Open stock colors! Blick pencils have been good for me, and I LOVE Blick's liquid watercolors. I've gone entirely to those for my K-1, just using the softer Prangs for my bigger kids. Great post Mr. E - Industry??? Are you LISTENING?? xacto - model 41 - seriously no joke and the best sharpener. Mine even died after two years and they sent me a new one! I use the twistable crayons by Staples. Better than Crayola, less expensive, and I am using some from 5 years ago. Only Prang watercolors for me, like the previous commenter said! Open stock and nice, bright colors. I am about to switch to Ticonderoga Laddie pencils, too. And no erasers. Sorry, kids.